Recalibrating — or resetting the cup size or fill level of a cup — a Nespresso machine is easy, but many users tend to find the results “slip” over time; many of us have to regularly recalibrate. If you find this frustrating, you’re not alone. I’d love to hear from some of you… will you share your experiences? Maybe Nespresso engineers will chime in. The instructions here are for an Essenza machine, but all operate similarly. If you don’t want to try with a fresh capsule, just practice on a used one. 2) Press and hold either the espresso or the lungo button for at least 3 seconds; then, just release as soon as the level reaches your preference. 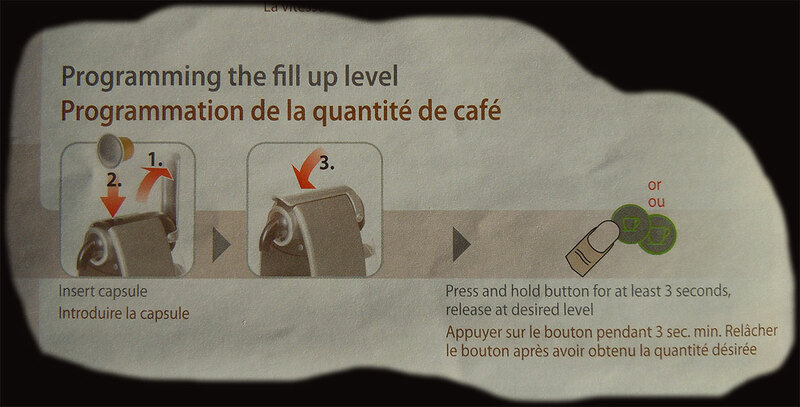 Instructions from a Nespresso Essenza machine. Hmm… Funny, I had a similar watery milk problem with my new Aeroccino 4. I thought I was going to have to return it, but it just fixed itself. I have no idea what the problem was, but it made very watery mile 2-3 times, and that’s it. It’s been working fine since then, for dozens and dozens of frothings. Thank you ! That was really helpful. Indeed, it works for other types also . I have a DeLonghi and worked perfectly. Thanks again! I have an older delonghi Nespresso pod machine. It has water in the machine when turned on both 1 cup and 1/2 cup buttons flash and continue to flash if you press the 1 cup button it just continues to run water unless you manually press the 1 cup button again to stop it. There appears to be just a little steam arises from machine when the 1 cup button is first pressed not excessive is this usual in colder weather. Have tried all the recalibrate suggestions. Any help would be most great fully received. Is it the bin and a new one. Hello Marilyn — I wish I could help, but I can’t diagnose that problem. These machines do seem to definitely have a shelf life. I’m preparing to purchase my fourth, and each machine seems to last about 3-4 years before it struggles in one way or another, usually with how the water runs through the machine. I’ve also had button problems, too. For another opinion: this guy seems really knowledgable about Nespresso machines: https://youtu.be/ne-GoivuGbU. Yes, that’s the way I did it and it worked (still it “slips” overtime, have to recalibrate again). Start with your machine turned off and plugged in. While pressing and holding the lungo button, turn the machine on. Release the lungo button after 3 seconds. Your machine has now been restored to approximately 1.35 ox. for the espresso cup and 3.75 oz. for the lungo cup. Thank you. This solved the problem instantly. Wish I had found this site weeks ago. The directions are for the Essenza C91, but I think they apply to all Essenza models. My brand new machine is only bosching out about 50ml on the bigger cup setting. My instruction manual is annoying as it just contains pictures and no explanation notes. Coffee is really lovely and the milk frothing machine is unbelievable, but I need to get my 110ml of coffee. Seriously. Thank you for the help in recalibration my machine lungs cup setting. Very valuable advice. Birmingham UK. Easy fix– thanks so much for posting this! I found that I just had to push the button down a little harder and it worked. Obviously not too well made!!! Only unintentionally as when the tube is clogging or there’s a pump malfunction. And the result is always a slower stream in my experience. Is there anyway to change the speed of the shot coming out? My M100 has the same problem time and time again,,, fed up with it next, machine which is imminent will be Dolce Gusto. I find that if doing consecutive shots with my Nespresso U, the first shot is always about 1/2 to 2/3 of the volume of consecutive shots with the same setting. It’s kind of annoying but it’s not a big deal because I use it as an opportunity to flush the machine and warm up the outlet. I’ve recalibrated my machine but the results are inconsistent. Five times in a row I’ll get the desired level, the sixth, substantially less (rarely more). Occasionally every other time will be less. Any solutions or is this just a quirk with the machine?